I got this book in a book subscription that while I didn't like the contents of (so I ended up not posting a unboxing) I decided to read the book. 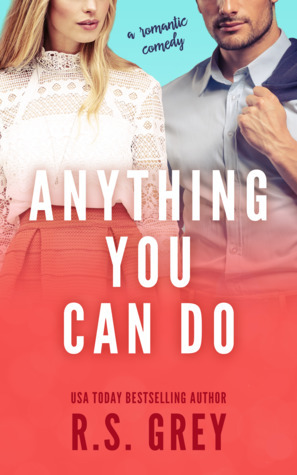 Anything You Can Do is pretty much a stereo typical Romantic Comedy and that is absolutely not a bad thing. I went into this expecting some fun and that is exactly what I got and also what I needed. I've learned that sometimes I don’t always need the book to surprise me or have some plot twists that leaves me gasping in surprise. The two romantic protagonists are Daisy, the main narrator of the book. She is of course the skinny, blonde, young doctor who is a big immature. We tend have her competitor and childhood rival Lucas who is of course the most hottest main in Hawthorne, who is also a doctor and has abs that can grate cheese. While I did enjoy the sexual tension and the hot scenes between Daisy and Lucas, Daisy's constant competiveness and overall oblivious of her feelings were annoying. When Lucas finally confronted her on this I almost cheered out loud! The ending pretty much was what I thought it would be and I am actually pretty glad about that. Sometimes you need a happy ending, no unanswered questions, no waiting for the sequel. Just an ending.